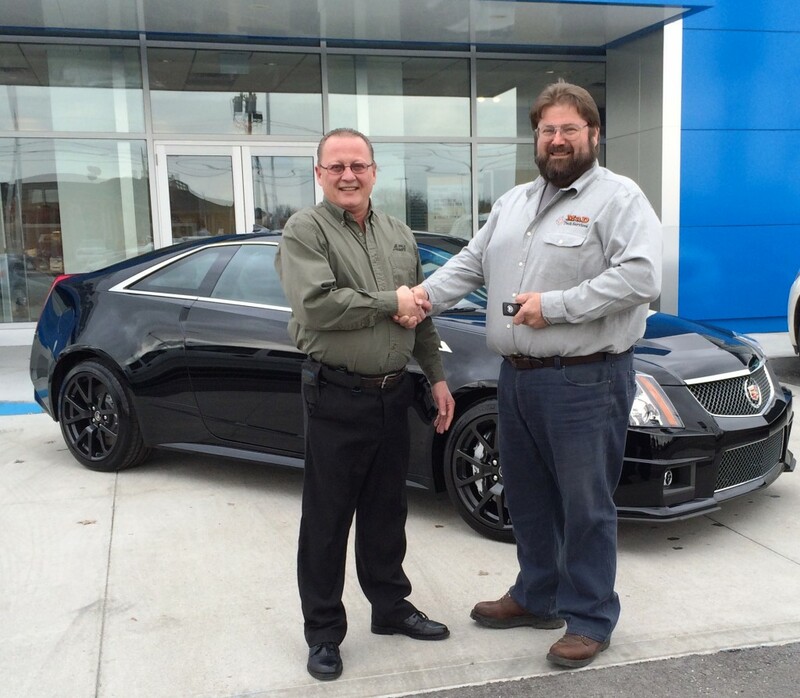 Richie Groves, Branch Manager at ADI’s Indianapolis location, hands over the keys to a new Cadillac CTS-V to Mike Hempstead, co-owner of MaD Technical Services. I truly enjoy this time each year where we get to award one of our loyal dealers with a brand new car! Earlier this week, ADI announced that Mike Hempstead, co-owner of MaD Technical Services in Greensburg, IN has won a brand new Cadillac CTS-V through ADI’s Customer Appreciation Car Giveaway Sweepstakes. Mike is the lucky recipient that was randomly selected from more than 13,000 entry forms received last year through our sweepstakes offering. Mike has been in the security industry for more than 15 years, and depends on ADI for all his installation needs. He visits the ADI Indianapolis branch, and also purchases online through ADI’s redesigned website. Mike and his colleagues participate in numerous local ADI training events, and attend the ADI Expo each year. For twelve years, we’ve been giving away a new car to one lucky dealer. In the past, we have awarded luxury vehicles including a Ford Shelby Mustang, Chevy Camaro, BMW, and Porsche. This year, we will give away a Chevy Corvette which will be featured in the ADI booth at some of the industry tradeshows during the year, including the upcoming ISC West show in April. You can enter for your chance to win by completing an entry form at the show, or at any local U.S. ADI Expos. Click here, for more information and the complete 2014 ADI sweepstakes official rules. We understand how important our customers are and we are always looking for ways to express our gratitude. We offer numerous events through the year ncluding the Expo training seminars, branch customer appreciation days, vendor product demos, training classes and tradeshow events more. This year, ADI and our manufacturing partners will continue the tradition of hosting the best party at the ISC West show in Las Vegas. The ADI Customer Appreciation Event is set to take place on Thursday, April 3rd at the Hakkasan Nightclub in the MGM Grand. Dealers can stop by the ADI booth #12031 at the show to inquire about tickets. Stay tuned for more information on ADI at ISC West, and click here for a list of upcoming ADI events. « How Well Do You Know the NFPA 72 National Fire Alarm & Signaling Code Requirements for Emergency Communications Systems?